Niebiesko-Czarni was one of the most popular Polish youth bands. The band began with playing typical rock �n� roll, gradually progressing through beat towards rhythm and blues, soul, underground, experimental, and progressive rock music, the last of which is represented by the band�s first Polish rock opera Naga. 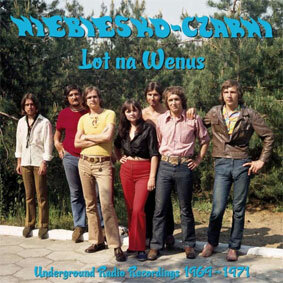 This LP is a wonderful selection of Niebiesko-Czarni�s mostly never published on vinyl 12 radio recordings from 1969 to 1971, a period in the band�s history most oriented toward underground and experimental music. In this period the band was under strong influence of Jimi Hendrix, Traffic and Collosseum. Deluxe edition included 8 page full color booklet, in laminated gatefold cover and limited to 100 copies.